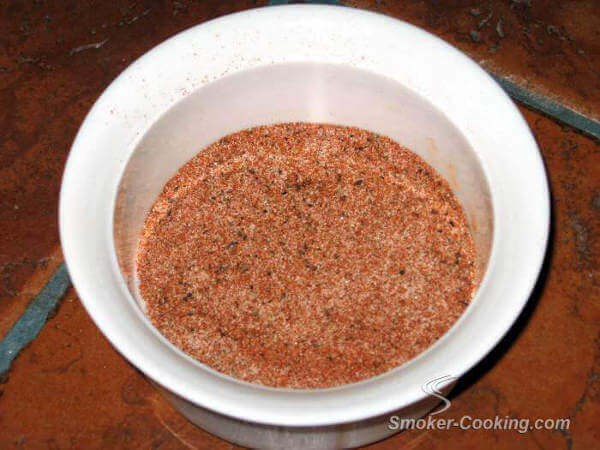 This Smoked Chicken Dry Rub Has Great Flavor! Making and using chicken dry rub is easy to do, and when a good dry rub recipe gets all over your chicken, it makes things really tasty! There's not too much difficulty in making a batch of dry rub, but there are a couple of things to watch out for. One of the most important things to pay attention to is the amount of salt being used in there rub recipe. It's very easy to have a large proportion of salt in relation to the herbs and spices in the mix. The reason for that is that spices and herbs are typically light in weight and not very dense. Compared to the herbs and spices, salt is very heavy, so it's easy to let it overpower the flavor profile. If your recipe includes garlic salt, onion salt, celery salt or seasoned salt, be especially cautious of adding any more plain salt to the recipe. Personally, I often put together chicken dry rub recipes with no salt at all. I will salt the chicken lightly first, so I know exactly how much salt is going on. Then I'll shake on the salt free dry rub mixture. Doing it that way prevents serving over-salted foods. When a dry rub has salt in it, you just don't know how much salt is actually getting on the food when you use it. After combining the ingredients, store in a sealed container. Makes enough for one whole chicken, or six chicken breasts. Rub Those Chicken Breasts With Flavor! The chicken has been seasoned on all sides with the dry rub, and now it will sit there for about an hour to make sure it's fairly dry before going into the Weber grill to smoke. In this case, I didn't season the chicken with salt before I put on the rub. The chicken breasts were brined, so they were already plenty salty. No need for more salt coming from the dry rub or from a shaker! 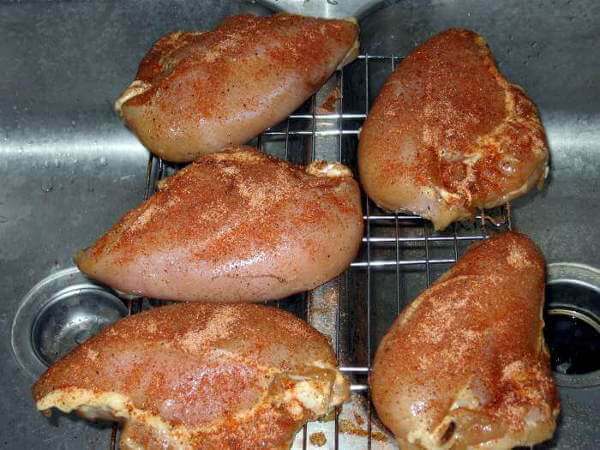 Skinless chicken breasts tend to dry out if they're cooked for a long time, so I've found it better to smoke them at 275 degrees. Apple wood chips are my favorite for adding smoke flavor. Remove the breasts from the smoker when the internal temperature reaches 165 degrees Fahrenheit, and they will be tender and juicy. As an option, glaze them with your favorite bbq sauce when they reach 160 degrees. Put them back into the smoker for another 5 minutes to finish.